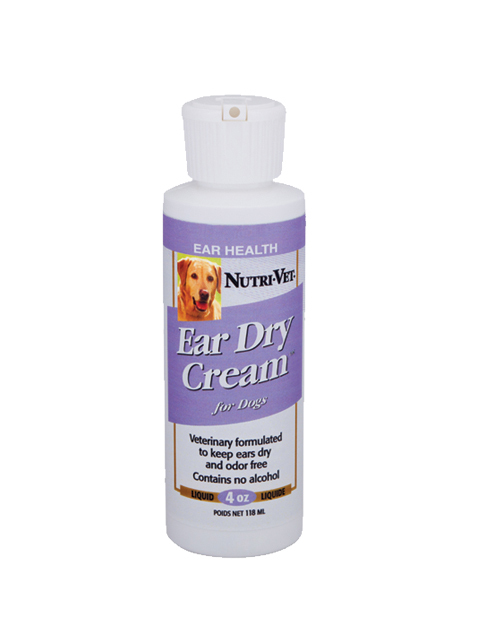 Ear Dry Cream is formulated with a special blend of natural ingredients to keep ears dry, clean and odor free by providing a moisture barrier within the ear canal. It is particularly well suited to use after bathing, for dogs with floppy ears, or dogs that swim or hunt. It contains NO alcohol. Directions for Use: Apply cream directly into ear canal and massage gently. Once dry, Ear Dry Cream will act as a moisture barrier. It is a good idea to first remove wax and other matter with Nutri-Vet Ear Cleanse. Water, Silica, Apple Cider Vinegar, St. Johns Wort, Rosemary, Lavender Oil.